The constellation Pegasus. Roll mouse over to see labels. Pegasus is a large and prominent northern constellation, which appears highest in the evening sky in the months around September. Its brightest stars form part of the easily recognisable asterism the Square of Pegasus, which comprises three stars in Pegasus and one in Andromeda. 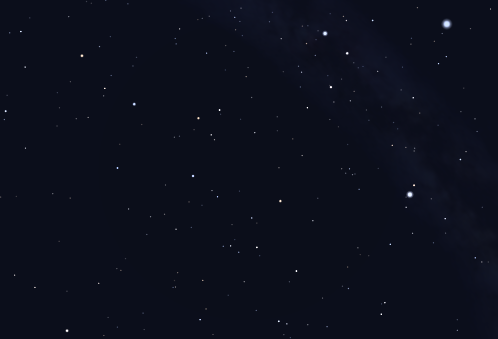 The northern-most two stars in the Square are often used as a starting point for star-hopping to the Andromeda Galaxy M31. Lying away from the Milky Way, this sky area has few deep sky objects, but Pegasus is home to the bright globular cluster M15. In Greek mythology, Pegasus was a winged horse, sent by Zeus to fetch thunder and lightening from Mount Olympus. Pegasus contains the following Messier object: M15. Pegasus contains the following Caldwell objects: C30, C43, C44. 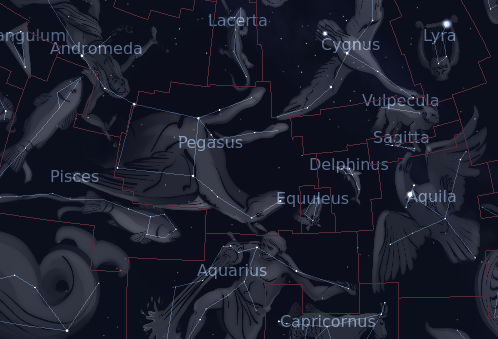 The following constellations neighbor Pegasus: Andromeda, Aquarius, Cygnus, Delphinus, Equuleus, Lacerta, Pisces, Vulpecula.